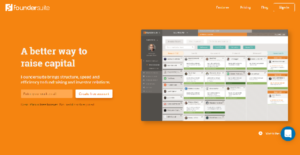 Foundersuite is a venture capital and investor relations management software. It equips startups and budding businesses with a solid and comprehensive platform to help them raise capital, find the perfect investor and expand their business with ease. The software is built on the frustrations of entrepreneurs who found it difficult to raise money to financially fuel their enterprise using outdated spreadsheet-based practices and old legacy systems. With Foundersuite, startups can access thousands of angel investors and venture capitalists to find those who are likely to fund their business and all their endeavors. The software gives users absolute pipeline visibility, enabling them to instantly know the status of their investors and move them through the funding process efficiently. Each team member can access all the information and are aware of their tasks and priorities. Foundersuite ensures no one misses a beat and no opportunity slips through the cracks. Foundersuite is designed to alleviate the pressure of funding off from startups and growing businesses. Searching for investors who are willing to bet on your business can be a time-intensive process and can cost you a lot in terms of money, time, and resources. You need to spend a great deal researching potential investors and make a perfect pitch on how their brand and their philosophy fits well with your business. Many times, a lot of entrepreneurs find themselves unable to reel in and make partnerships with investors. Foundersuite levels the playing field by providing you and other growing businesses and startups with access to thousands of investors, angel investors, and venture capitalists. Gone are the days when you have to individually go through potential investors and evaluate long and hard to see if they are a match. Foundersuite helps you find matching prospects via Facebook, LinkedIn, and other social pages. It accelerates your search for an investor and dramatically improves your chances of creating fruitful partnerships. Having total visibility over your investor pipeline allows you to effectively handle your relationships with your investors and move them through the funding process faster. You don’t have to guess the status per investor. You can instantly determine where they are at in your pipeline at a single glance. This helps you organize and manage your relationships and order your priorities. If you are interested in Foundersuite it could also be a good idea to investigate other subcategories of Best Fundraising Software collected in our base of B2B software reviews. Each enterprise has its own characteristics, and might require a specific Fundraising Software solution that will be fit for their business size, type of customers and employees and even specific niche they cater to. We advise you don't count on locating an ideal app that will be suitable for every company regardless of their history is. It may be a good idea to read a few Foundersuite reviews first and even then you should pay attention to what the software is supposed to do for your company and your workers. Do you need a simple and straightforward app with just basic functions? Will you actually make use of the complex functionalities required by pros and big enterprises? Are there any particular features that are especially beneficial for the industry you work in? If you ask yourself these questions it will be much easier to find a reliable app that will match your budget. How Much Does Foundersuite Cost? We realize that when you make a decision to buy Fundraising Software it’s important not only to see how experts evaluate it in their reviews, but also to find out if the real people and companies that buy it are actually satisfied with the product. That’s why we’ve created our behavior-based Customer Satisfaction Algorithm™ that gathers customer reviews, comments and Foundersuite reviews across a wide range of social media sites. The data is then presented in an easy to digest form showing how many people had positive and negative experience with Foundersuite. With that information at hand you should be equipped to make an informed buying decision that you won’t regret. What are Foundersuite pricing details? What integrations are available for Foundersuite?